World Vitiligo Day is a global observance that aims to raise awareness of vitiligo, an incurable chronic skin condition surrounded by numerous misconceptions. This awareness day is held on June 25. Vitiligo is a skin disorder characterized by depigmentation of portions of the skin. The cause of vitiligo is unknown. There is known cure for the disorder, but several treatment options are available. Many vitiligo patients face social stigma, neglect, and discrimination, particularly in African countries. For example, Sierra-Leonean-born ballet dancer Michaela DePrince was derided as a “devil's child” in her early childhood because of vitiligo. 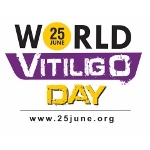 World Vitiligo Day was conceived by Steve Haragadon and Ogo Maduesi, the founder of the Vitiligo Friends network and the founder of the Vitiligo Support and Awareness Foundation, respectively. This awareness day aims to combat numerous misconceptions around vitiligo and improve the quality of life of vitiligo patients. The date of June 25 was chosen to commemorate the death anniversary of Michael Jackson who was diagnosed with vitiligo in 1986. The first celebration was held on June 25, 2011. The main event was took place Lagos, Nigeria. A year later, Vitiligo Research Foundation joined the team of organizers and launched the website 25june.org.